It was indeed a grand 1st birthday celebration by Astro Arena over three days since Friday, culminating with a sumptuous dinner at J W Marriott Hote last night. Sadly, it was also held over three days where Christians observed Good Friday, Easter Vigil and Easter Day. Nevertheless, congratulations for having made big leaps in one year, but there is much more than can be done for Malaysian sports. I clearly remember when I attended the launch of Astro Arena at the Olympic Council of Malaysia Hall, that promise was made that we will see grassroots sports - community, schools and clubs - well covered. I feel this part of the bargain has not been delivered. It is great that we get to see "Live" matches of our various national teams or players playing at home or abroad.The M-League, National Hockey League, badminton, bowling squash, boxing, rugby, and motor-sports are among the sports are being covered at great length. There are talk shows to address Malaysian sports woes, interactive programmes, history of Malaysian sports, while other sports are covered through the sports news segment - Nadi Arena. 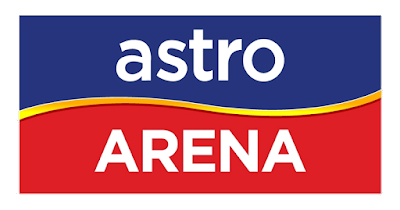 Like any private entity, it is obvious that Astro Arena is profit driven and no doubt that they work closely with many National Sports Associations, the bottom-line is still the Ringgit and Sen they make. This is where some sports who do not have attraction to pull in the sponsors, lose out in terms of coverage, as more often than not, they are asked to pay for coverage. One sport recently organised an international age-group competition and was looking forward to some coverage.They were asked to fork out some RM30,000 for the coverage. The officials felt that it was better to use the money to further enhance their development programme and decided against paying for the coverage and no surprise their event was not covered. This is where Astro Arena have to fulfill their CSR deeds and help the poorer associations too. There are still many NSAs who are not given much coverage and this has to be looked into. 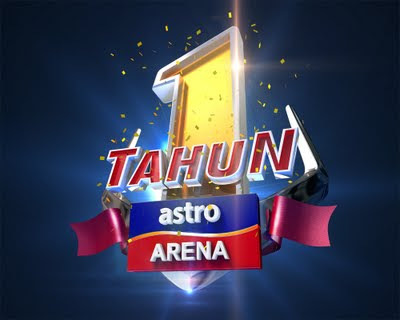 Just wondering if some of the huge amount spent on the birthday bash could have been used to give coverage to the "smaller" sports, and Astro Arena, would have got more followers watching their Channel. Of course, a great part of the birthday bash was partly sponsored, like the dinner at J W Marriot, judging from the mileage given to this hotel. But after having given themselves a huge bash for their first birthday, they have to step it up every year and I cannot imagine how big each of their birthdays are going to get. On hindsight, maybe Astro Arena has made huge profits in the their first year, that they were justifying the rewards with the bash. It is also time that Astro Arena consider having a couple of programmes in English too, to further diversify their viewing audience. Lastly to touch on Astro Arena honouring Malaysian Sports Legends at the Dinner, it was indeed noble to recognise the Legends of Malaysia, but they must be careful in following the order in honouring them. Several top Legends were not in the list that were honoured on Sunday, while some were considered too young to be called Legends. In the end, Astro Arena, certainly made the impact to market themselves and already with seven million supporting them, they can only grow bigger. It is just hoped that as they grow, they will also extend their tentacles far and wide to reach the smaller sports associations and grassroots. Many came, praised and showered Astro Arena with endlessly accolades, but I hope my stance to view the picture differently and give a few constructive criticisms, will be taken in right sporting spirit to see Malaysian sports grow further. Afterall, after having covered Malaysian sports for the past 30 years, I have seen the good and bad facet of Malaysian sports and surely qualify to pen my sincere observations straight from my heart. 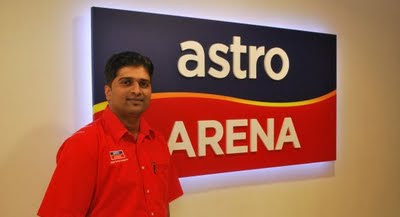 Everything said, Astro Arena has done well and is a fresh breath to Malaysian sports. Happy Birthday Astro Arena and wishing you many, many more fruitful years ahead! After Formula 1 and the World Motorbike GP it's now motor rallying for Air Asia. The latest venture for the Malaysian based low cost airline is the co-sponsorship deal with the GSR Pennzoil Rallying team which is taking part in the Asia Pacific Rallying Championship(APRC) and also the Malaysian Rally Championship. agreed to a one-year sponsorship deal. also the British MotoGP and now we are also into motor rallying. of Air Asia Azran Osman Rani. as he and co-driver Jagdeev Singh prepares to tackle the six-round APRC championship. field in the A6 2-wheel drive class. Queensland, Australia is next, scheduled for May 13-15 and after that is New Caledonia in June followed by New Zealand in July and then Japan and China next. stable of drivers include the former world champion Karamjit Singh; the four-time APRC champion Cody Crocker and the reigning APRC champion Katsu Taguchi. Remembering the road to success. It did not happen overnight. Many have short memories and forget to acknowledge the road to success. This piece is to refresh the memories. I wrote this piece for Malaysian Today in 2006. THE National Under-20 soccer team is to come under the National Sports Council (NSC), as a long-term plan to build formidable national team. Infact, a MoU between NSC and the FA of Malaysia has already been signed have already been signed early this month. And on Tuesday, the Cabinet Committee for Sports headed by Deputy Prime Minister Datuk Seri Najib Seri Tun Razak, further affirmed the status of the National Under-20 team when he instructed that the National Sports Council (NSC) immediately take charge of the team both on the financial aspect and training. The Under-20 team coached by K. Rajagopal is seen as the hope for future of the sports. However, there is more to than the eye meets in this delicate situation. While the move to take charge of the National Under-20 is noble, where all assistance will be taken care of by the Government, but there are too many technicalities which are involved which will throw plan in disarray. For starters, the FA of Malaysia affiliates (State FAs), who have players in the Under-20 who are contracted to them, will be up in arms, as they no longer can use the services of these players in the domestic league – immediately the Malaysia Cup competition. Secondly, the Under-20 players who already have contracts with the State FAs will be reluctant to severe ties with their employers as they would definitely be getting more than what NSC will be paying them monthly. Then, there is the issue of governance of the team because if NSC manages the team, FA of Malaysia could run foul of allowing Government interference, which FIFA, does not condone and will not recognise Malaysia football. Of course there are ways to work around it with FA of Malaysia still being involved with the team, to keep everything above board. Lastly, with the Asian Youth championship just around the corner in India, anything drastic changes mid-stream with a team which has been shaping up well, could prove disastrous. However, while both FA of Malaysia and NSC having in principle agreed on the “marriage” in the best interest of soccer in the country, there is always a common path which can be taken. In this context, both FA of Malaysia and NSC are expected to sit down and trash out the finer details so that this program is not derailed. Without doubt the Government is serious about sports and thus their involvement. The fact that a Sports Cabinet had been set up and chaired by Deputy Prime Minister Datuk Seri Najib Seri Tun Razak, himself, underlines the seriousness of the Government to see sports in general excel in the world arena. At the Sports Cabinet meeting on Tuesday morning, several other decisions were also taken and the decision to introduce the National Coaching Scheme, was another step which takes Malaysian sports to another level. Gone are the days when coaches were no recognized, or sports did not offer a career to athletes. With the introduction of the Scheme, which was presented by the National Coaching Board, coaching can now become a career. And coaches will also get the opportunity to upgrade themselves with knowledge and the more they gain, the better remunerations they will get. And it is not just the fulltime coaches who benefit from this scheme, but also the many part-time coaches who do a lot of development work, but are more often than not recognised or remunerated. With more qualified and satisfied coached in place, it is hoped that the overall standard of sports will rise at a fast level for the nation to attain success at the Asian and World level in the near future. The elite training centre in Hertfordshire, near London, which is operational from yesterday (Thursday – June 22), is another milestone for Malaysian sports, where an opportunity has been created for Malaysian athletes to be based and train overseas where they will be exposed to high level training and competition. Squash will be the first to utilise the facility and followed by the Under-20 team next in line. Sports in the country have never had so good and if only the returns equate with the money spent, it will all be a dream come true for the nation. Datuk Dr Harjit Singh's letter in announcing his withdrawal from the Malaysian Cricket Association elections today for the President's post. THE ONE CERTAINTY OF GAINING OR WINNING A POST IN SPORTING ORGANISATIONS IS THAT ONE DAY YOU’LL LOSE IT. AND SOMETIMES THE GOING CAN BE EXTREMELY PAINFUL. 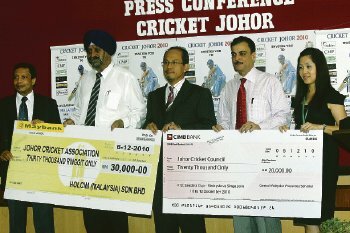 There was just one discordant note struck in the packed, perspiring room at the Kinrara Oval during the last Biennial General Meeting of the Malaysian Cricket Association 2009. Amid all the toothy grins and cheerily bashful celebration of a profound change of heart by delegates, there were the sullen and melancholy losers, and, any cricket loving person with a heart of human feeling and passion would obviously have felt the sympathy. They had also served cricket and had enjoyed the job. Differences of “policy and opinion” coupled with a profound lack of common consensus had resulted in their downfall. The unlucky ones had their eyes narrowed, and their expression, previously benign, hardened perceptibly. There was that combative stare, a painful exit with loss of words. Such is the passion the glorious game of Cricket commands. They took a mental step back and blathered something about delegates being deceptive. They had hit a nerve. It is not so much that they were right in the case at issue - their lugubrious demeanour should never be taken too seriously – in the general scheme of things. Is it any longer possible to regard the hierarchy of Malaysian Cricket as something to be enjoyed doing, when the scrutiny, expectation and judging are so constant and cruel, and when an official is no sooner appointed than the hawks have begun to whip up speculation as to when, and how, he will lose the job? This demeanor even before a candidate is victor in a democratic election? There is this unattractive tendency these days to “group campaign” rather than assessing an ‘outside the camp’ individual’s attributes, abilities and passion. And if the ‘outside the camp’ person were to succeed in an otherwise ‘group campaign’ majority win, he will be disowned abruptly by the majority in the corridors of power once he attains such authority. It is as if he ceases to be a worthy subject, of this glorious gentlemen’s game we call Cricket, for support and become an object to be heckled, harassed and generally derided until the position he holds becomes untenable. There is a trend perpetuated in politics and sport, the two most publicly argumentative spheres of our life. 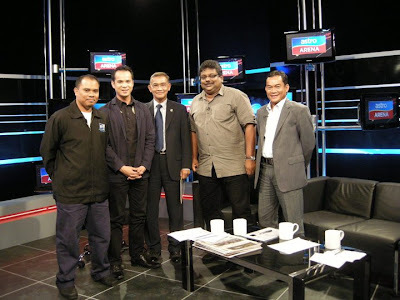 And, while there may be those involved in running political groups who beg to differ, the rather more trivial responsibility of being in the hierarchy of Malaysian Cricket has few equals when it comes to the syndrome of the REVOLVING DOOR. It seems you are already adjudged out even before you come in to bat – timed out? The trail of sporting hierarchy, indeed, is strewn with complicated incidents of back-biting etc.. It has sometimes appeared beyond the wit of man to administer a hierarchy handover in which nobody is hurt, belittled or ridiculed. I have been told to believe that I have attained the most nominations for one of the positions of ‘authority’ in the forthcoming biennial unpleasantness and coupled with the promised support of at least two of the three states that did not send any nominations, and, either modestly or proudly, acknowledging the fact that I am a born survivor amidst all the factors of ethnicity and regional factors compelling the sporting destiny of our nation, I have had to very painfully decide acceptance or declining in the face of the expectations of the State affiliates, especially those outside and in the periphery of the Klang Valley. It is so painful that it makes me think why I did indulge in this sport. I could have done better looking after my family and other charities. But it is the passion that was transfused into my body and soul by my dear father, Meva Singh, and his friends in the Kilat Club of the old, the MS Maniams, Rajalingams, Shepherdsons especially Mike, the Gurucharans, Ranjits and many others not forgetting the inspirational Alex Delilkan (Prof Emeritus Datuk), Karu Selvaratnam and including the late Dennis de Silva and Peter Selvanayagam. The sporting atmosphere was different then – it was all about passion and passion ruled the cricketing fraternity. My mind has been exploded by the complex chain of thoughts and soul-searching, whether my advancement into the fire of officialdom to sincerely serve the King of Games would ever be appreciated, and, which has in the past been a proven mistake to those who had trodden on this vicious path. I even speculated that this soul-searching might all be in vain and a new line up coming in anyway, and, with my position not being in any group, I never found a realistic option than to reach a momentous decision of withdrawing from the field rather than be upstaged by forces from within and outside even after being elected. In spite having support from most quarters and then being combined with a sense of unease, a feeling that I would frustratingly be walking away from a job which I believe I had become rather good at (forgive my self-confidence), as President of Johor Cricket twenty five years and having served Malaysian Cricket’s Deputy Presidency thirteen years, and then, leaving the job and work half-done because of any untenable circumstance around, I felt I should be rather work with the new team from outside and extend my full support. My absence would perhaps bring a sense of relief to them, I suppose. I can still recall and cast my mind back to 2003, raise my head from a putt and come up with an interesting anecdote about my own departure from the bed of thorns. I sincerely apologise to all affiliates who have given me their unsolicited support and urge them to work hand in hand with this new group. We should all have and believe in high expectations from this new group and I am confident they will perform. Finally, I hope the incoming band will undertake their responsibility seriously and to not exhibit their undesired authority especially on the State affiliates and players. They have to look beyond the Klang Valley. On a lighter note, it is not beholden that the Klang Valley is God’s gift to Malaysian Cricket as the composition of this new brigade will depict. Cricket is played everywhere today. We have been struggling all these years from the time the new Malaysian Cricket Association arose from the grave in 1990 and brought it to the level of today, thanks to collective support from all quarters. I wish Malaysian Cricket and its new custodians all the best and stand down not retired hurt. FOUR candidates will be battling to succeed Tunku Imran Tuanku Ja'afar as the Malaysian Cricket Association's (MCA) president at its elections in Bandar Kinrara tomorrow. Tunku Imran, who has helmed MCA for 20 years, has declined nomination to allow for a change in leadership of an association struggling to take the sport to national prominence. Johor Cricket Association Datuk Dr Harjit Singh, current MCA deputy president Wilfred Abraham, former deputy president P. Krishnasamy and current MCA vice president Asgari Fuad Stephens are the nominees for the president's post. All four have also been nominated for the deputy president's post along with former MCA vice president Mahinda Vallipuram, who is attempting a comeback after resigning his post in 2009. Horse-trading, so often the case in MCA elections, will likely ensure the list of contestants for the president's and deputy president's posts is reduced once each candidate has assessed their support among the 16 affiliates. There has been discord in MCA since the last elections in February 2009, bringing about a series of resignations by office bearers. Mahinda's departure was followed by that of deputy president Datuk Dr Amarjit Singh Gill and Gopal Sreenevasan. It has led to a free-for-all for the 2011-12 executive committee posts with nine candidates nominated for the two vice president positions, four each for honorary secretary and honorary treasurer, and a staggering 18 for four ordinary member seats. I got back my Blog a few hours ago after four months of worry whether I was ever going to get it back after my email was hacked in December when I was in Oman for the 2nd Asian Beach Games. It has been an agonising and stressful four months in my attempt to get back my Blog. At Google, we take your privacy and security seriously. We're committed to returning accounts only when we're sure we're giving them back to the accounts' owners. Unfortunately, based on the information you provided, we were unable to verify that you own this account. To ensure that we are not compromising the security of the data, we can't return the account at this time. If you can provide additional information to verify that you own this account, please visit http://www.google.com/support/accounts/bin/request.py?ara=1 and submit another request, providing as much accurate information as possible. If you're unsure about specific dates, provide your best guess. In losing my gmail account, I lost some 1,000 email contacts too, besides my blog. I have since got another gmail address, but it was the blog that I wanted back at all cost because it was not so much of my postings since I started blogging in May 2009, but the archives I had painstakingly complied from my reporting days with The Malay Mail from 1979-2006, especially my columns and comment pieces. At this point, I want to go on record to thank two persons who are responsible for me getting back my blog. First it is, Gurdip Singh of MYCert (CyberSecurity) who first gave me some hope of getting my Blog back by alerting my case and Hanson Toh, of the newly setup Google Malaysian office. Just a quick mention that I've got the relevant people looking into it now. So no new news yet, but please continue to sit tight and I'll update you when I get something. Then I got an email from Google and here I am back on Blog. Thank you Gurmit and Hanson!! I have missed posting on my a great deal, but I am not going to write any of my thoughts of Malaysian sports issue over the last four months, because I might take a month to do so! I will just continue from today. And my first posting personal penned letter from Datuk Dr Harjit Singh, the President of Johor Cricket Council. Dr Harjit Singh was among the four candidates named for the Malaysian Cricket Association (MCA president’s post at the elections at the Bandar Kinara today. However, Dr Harjit has decided to withdraw and in a no holds barred statement, he reveals with a heavy heart why he is withdrawing from the elections. The other nominated for the President’s post are current MCA deputy president Wilfred Abraham, former deputy president P. Krishnasamy and current MCA vice president Asgari Fuad Stephens. All four have also been nominated for the deputy president's post along with former MCA vice president Mahinda Vallipuram. It is sad that a good man like Dr Harjit has to take this decision, but Malaysian sports lose the few good men we have in sports because of the state of Malaysian sports! Read what he has to say in the posting which follows.